The Cuero is a mythical Patagonian beast which I have mentioned in a previous entry on Nahuelito. I have found many references on it in lakes set well within the Andes, in the forested areas of Patagonia. But until now I had not seen it mentioned in the lakes located on the arid steppe region of Patagonia. Yesterday while going through my old books, I came across a story called "el cuero del agua" (the water hide). It is a true story that the author, Elías Chucair compiled in 1965, it was told to him by an old man (then in his eighties) by the name of Ambrosio Meilivio who then lived in the town of Ingeniero Jacobacci. "...When that disgrace happened to that fellow Ramil, I was still very young (...) he had disappeared in the water, which was hard to believe, something like that hade never happened before"
"...his horse rolled and threw him along the shore of the lake (...) Ramil fell on top of something that resembled a hide that was lying by the edge of the watre, that quickly rolled him up and took him with a rolling motion into the lake"
Ramil was never seen again. Though the bodies of those who drown are thrown upon the shore, his never appeared. 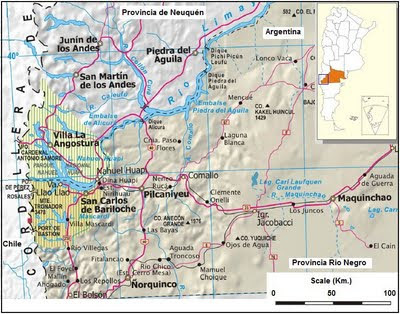 There are two lakes named Carrilaufquen in the area, the one mentioned in this story is the "Grande" (big), the other is the "Chica" (small). 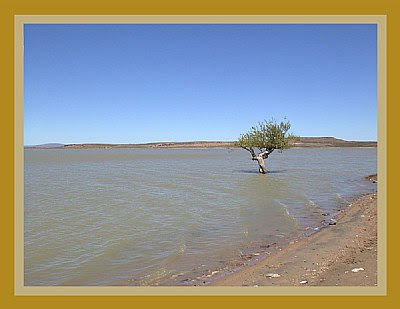 The lake is located in the "Maquinchao basin", 20 km (12 mi.) from Ingeniero Jacobacci nearly 800 meters above sea level (half a m;ile). Its surface area is variable (and is now roughly 67 km2 - 26 sq.mi.). It is a shallow (2 m - 7 ft.) and subsaline (i.e. very slightly salty) body of water, whose name in Mapuche language means "green lake". It has pejerrey (silverside - O. bonariensis ) and trout, and on very cold winters it freezes over for a few days. These two lakes are the remains of a great paleo lake that had a surface area of 1,500 km2 (580 sq. mi.) which was 70 m deep (230 ft.) which was formed by the melting permafrost and glaciers at the end of the last Ice Age some 12,000 years ago. Below is a map showing its location. 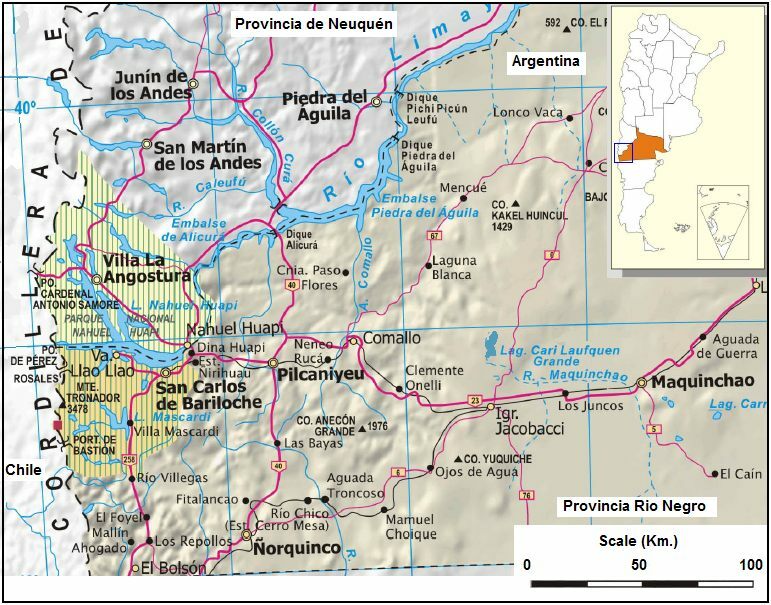 The lake is in the central part of the map and it is spelled differently (Cari Laufquen Grande). Chucair, E., (1996) La Inglesa Bandolera y otros relatos patagónicos. General Roca: Editorial de la Patagonia. pp. 99. Muñoz, Miguel Angel. www.usefilm.com. The Photograph is Here. Del Valle, R. A.; Tatur, A.; Rinaldi, C. A. Cambios en lagos y circulación fluvial vinculados al calentamiento climático del Pleistoceno tardío-Holoceno temprano en Patagonia e isla 25 de mayo, islas Shetland del Sur, Antártida. Rev. Asoc. Geol. Argent., Buenos Aires, v. 62, n. 4, dic. 2007. Online Here.